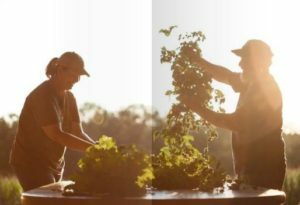 From a passion for all things locally grown, Little Miami Farms was founded with the mission to help preserve farmland while producing high quality regional products. Located near the Little Miami River in Spring Valley, Ohio, we’ve been doing traditional farming – including corn, soybeans and hay – on 75 acres since 2002. Though we respect tradition, we consider ourselves progressive…so after researching alternative crops that would meet local market needs, in 2014 we expanded into growing hops to supply local craft brewers as well as home brewers. We introduced two-row barley to the farm in 2015 and are currently constructing a malt house. We take great pride in the attention we give to what we grow and make and understand the value purchasing from people you trust. We are a small operation; tending to our hop yard daily and providing the best conditions possible for optimal growth and development. Harvested at their peak of freshness, Little Miami Farms’ hops feature the flavors, smells and textures of Ohio. We dry our cones on-site in a custom-built drying oast that uses low temperature air flow in order to maintain the highest quality flavor and aromas, with minimal lupulin loss from agitating the cones. Our whole cones are packaged and preserved on-site, minimizing handling and transportation … and making it easy for you to brew local! We are classically trained business professionals but prefer the great outdoors to the office. 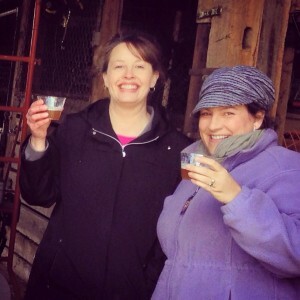 Our friendship started in the corporate world over 20 years ago when we discovered our shared interests and likes, including a drive to do things well and to do them right the first time. But we’re not too serious…we love to meet new people and have fun! Jamie Arthur – Chief Hoperating Officer, manages all the farm and hop yard operations. Be sure to read about life on the Little Miami Farms in Jamie’s Hop Blog. Reach Jamie at 937-532-9569. Krista Arthur – Eternal Hoptimist, supports the growing operations as well as special events. Contact us if you’re looking for a unique venue for your next event or would like to spend time relaxing at the Hop Lodge. Reach Krista at 937-367-1077. Amy Forsthoefel – Marketing Hoperations, manages Little Miami Farms marketing, social media and outreach. Stay current and connected with us on Facebook and #BrewLocal! Reach Amy at 937-750-2382.